After closing out Brooklyn in five games, the Miami Heat find themselves back in the Eastern Conference Finals for the fourth straight year. They have advanced to the championship round for three straight years, winning series against the Thunder and Spurs for repeat titles after falling to Dallas in 2011. 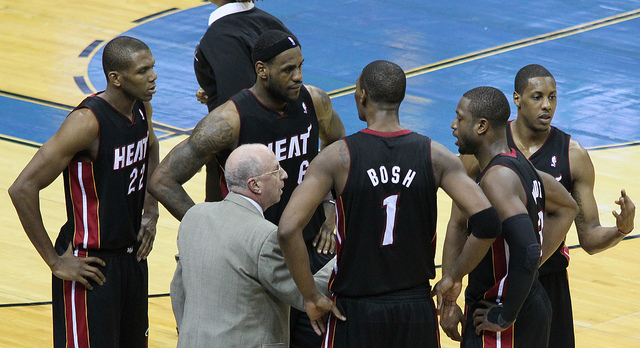 The Heat’s struggles at the end of the regular season had many National Basketball Association experts wondering about the club’s title prospects in 2014. A quick dispatch of the Nets combined with the struggles of Indiana and Washington has Miami looking like clear favorites to return to the NBA Finals. Do the Heat have a three-peat in them? Here are five signs that suggest they are more than capable of running the table again in 2014. Looking at the stat sheet at halftime of Miami’s closeout Game 5 against Brooklyn, you’ll see Wade with 20 points already on the board. He finished with 29. After LeBron’s mammoth, taxing performance in Game 4 (49 points), he could have used the help. Wade delivered. This balance to Miami’s attack was the point of bringing Chris Bosh, Wade, and James together. When Wade shows flashes of his old swagger, the Heat present an enormous problem for opponents. At the moment, Wade seems more comfortable at home, notching his best games at American Airlines Arena versus the Bobcats (Game 1, 23 points) and Brooklyn (Game 5, 29 points). LeBron has no problem delivering on the road. The best playoff games in James’s career have come while away, including his mammoth 45 points and 15 rebounds in Game 6 of the 2012 Eastern Conference Finals against Boston. He can handle that pressure. If Wade can continue to perform in Miami, the Heat have the answer home or away. Whether Washington or Indiana advances to Eastern Conference Finals, neither team presents much of an obstacle for Miami. Washington has the advantage of active big men while Indiana possesses considerable playoff experience. However, the lopsided scores of their series — Indiana has lost by 23, Washington by 22 — would suggest neither team is firing on all cylinders. While Miami is poised to make mincemeat out of their conference finals opponent, San Antonio has a much taller order, with the Oklahoma City Thunder or Los Angeles Clippers ready to face them. The Spurs have an old core of players that have a lot to lose in an extended series against younger opponents. 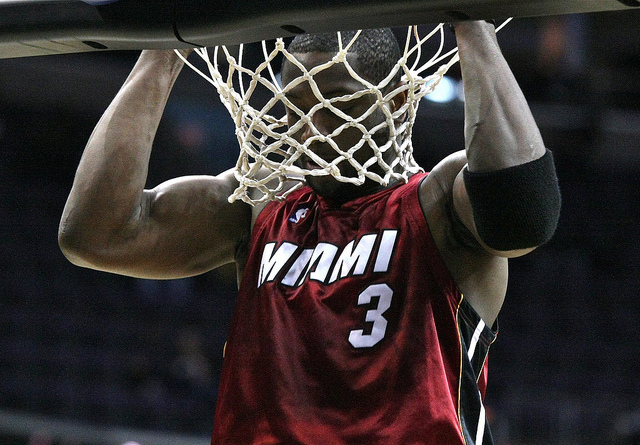 Should the Western Conference Finals drag on and Miami waltz to the championship, Ray Allen and Wade will get the extra rest they need to close the deal. Trailing by 9 points late in the fourth quarter of Game 5 against the Nets, Miami went into lockdown mode and finished the game on a 16-6 run, culminating in a LeBron steal off Joe Johnson to end the series. Johnson had been harrassed by Allen before James took the ball, and it has been clutch defensive plays like that which allow the Heat to feel like they are in every game. Between James’s determination, Allen’s shooting, and Bosh’s ability to hit late 3s, Miami has scoring options galore, but it’s the big defense that allows them to close deficits. 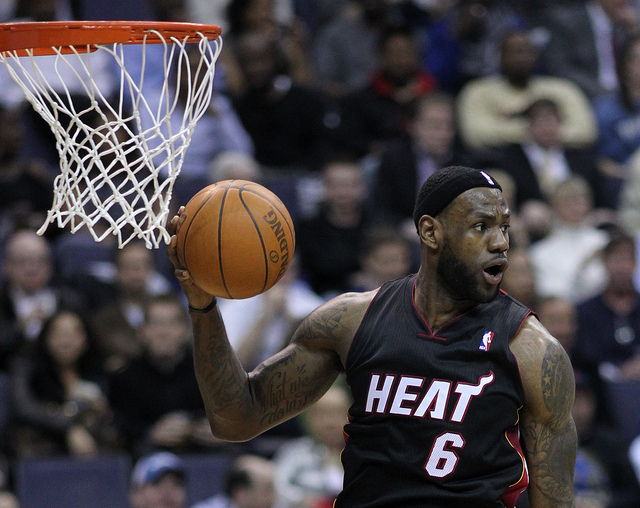 The Heat outscored the Nets by 32 points in the fourth quarter of the series. Allen hit the season-saving 3-pointer that pushed the 2013 NBA Finals to a Game 7 against San Antonio. He flashed a little of that magic in the closeout game against the Nets on May 14, when he nailed the go-ahead 3 that was the icing on Miami’s furious fourth-quarter rally. Even on a bad night like Allen was having (1-7 3PM-3PA), he has the capacity to drain a back-breaking shot. Of course, when Miami is nursing a lead at the end of the game and opponents have to foul to save time, there is no better player to send to the free-throw line than Allen. He’s delivered exactly what Miami hoped he would as a role player. James is averaging 30 points (on 56 percent shooting), 8 rebounds, and 6 assists in the first nine games of the playoffs. Those are MVP numbers, but the most impressive performance came when the Heat experienced their first bit of adversity in the 2014 postseason. Pushed around and beaten in Game 3 by Brooklyn, Miami needed a bounce-back game to right the ship. 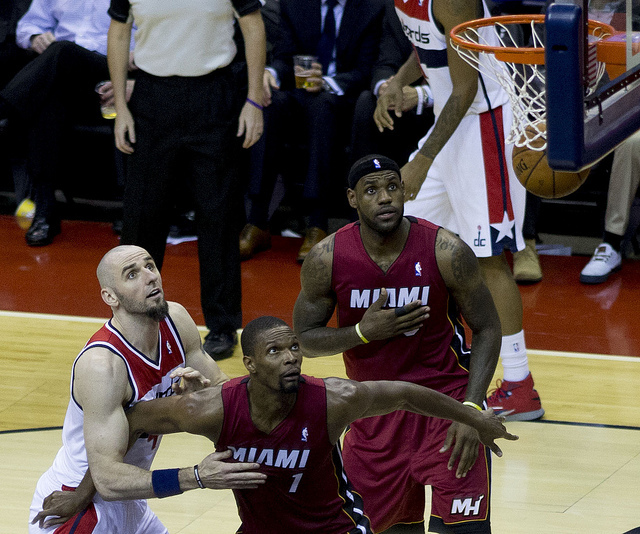 James dropped 49 points on 16-of-24 from the field in the Heat’s Game 4 win. Coach Erik Spoelstra described the performance as “indefatigable,” which was apt for the relentless approach James took in a game in which his teammates couldn’t find the basket. James is the ultimate weapon: a player who can’t be stopped because he can bully his way to the basket and finish. No matter how low the Heat get, they always have James ready to deliver the nuclear option. Miami has a stacked deck in its quest for a third consecutive title.